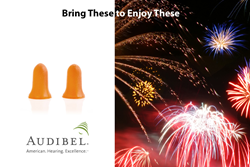 Audibel Hearing Center reminds families to be safe when attending fireworks displays for the Fourth of July by packing ear protection for each family member and keeping a safe distance. As your family gets ready to enjoy fireworks shows on July 4th, Audibel Hearing Center would like to remind everyone that it only takes a few simple actions to avoid long term hearing problems. We all know that fireworks are loud, but readers may be surprised to learn just how loud. Fireworks can reach decibels levels of 120 to 140. For noises this loud, the American Academy of Audiology lists the safe exposure time as zero minutes. This means that noise-induced hearing damage will occur without the use of hearing protection. Not everyone experiences the same decibel level when attending the same fireworks show. The exact decibels experienced depend on the observers distance from the booming and their age. Because children have narrower ear canals, they tend to experience the sound of fireworks as louder than adults. They are even louder for infants with their tiny ear canals. For this reason, infants and children should wear ear protection when watching fireworks (even at distances that adults judge to be safe for themselves). To keep ears safe on the 4th and prevent short-term and long-term hearing damage, follow these simple tips. Sit at least 500 feet from where the fireworks are launched. Fireworks noise for those 800 feet away ranges from 88 to 126 dB. But from 10 feet away, it’s 155 dB! Your environment is too noisy if you have to shout to be heard by someone standing next to you. Use common sense. Pain, ringing or buzzing in the ears is a sign that you are too close. Richard Amon has been engaged in health care for more than 20 years. In 1995, after receiving a degree in Physical Therapy, he moved to Southwest Florida and started on a cause that would help those who are hearing impaired. Richard Amon is Nationally Board Certified in Hearing Instrument Sciences and is involved with the Florida Society of Hearing Health Care Professionals, the International Hearing Society and the Hearing Loss Association of America. The Audibel Hearing Center team welcomes clients with mild, moderate and severe hearing losses. The hearing specialists pride themselves on bringing sound to the ears of even the most hard-to-fit clients. Products and services at Audibel Hearing Center include hearing aids, hearing evaluations, tinnitus therapy, hearing loss preventive advice and hearing aid accessories. The staff believes in treating people as individuals with unique challenges and needs. Clients can rest assured that the Audibel Hearing Center staff is eager to provide the best possible experience for each person coming in the door at any of our 5 SW Florida locations.